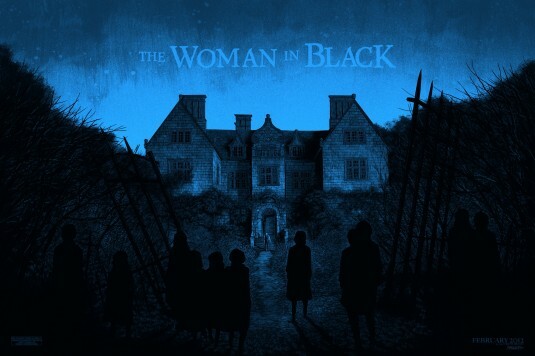 Here's a haunting new quad poster for THE WOMAN IN BLACK showing more of the ghost's of children we've seen hints of in the other posters and clips that have been released. The film hits theaters on February 3rd. Arthur Kipps (Daniel Radcliffe), a widowed lawyer whose grief has put his career in jeopardy, is sent to a remote village to sort out the affairs of a recently deceased eccentric. But upon his arrival, it soon becomes clear that everyone in the town is keeping a deadly secret. Although the townspeople try to keep Kipps from learning their tragic history, he soon discovers that the house belonging to his client is haunted by the ghost of a woman who is determined to find someone and something she lost... and no one, not even the children, are safe from her vengeance. Directed by James Watkins(EDEN LAKE), written by Jane Goldman (X-MEN: FIRST CLASS) and co-starring Ciarán Hinds(TINKER TAILOR SOLDIER SPY) and Golden Globe®-nominee Janet McTeer (ALBERT NOBBS).